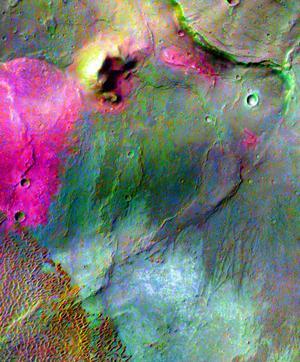 At Syrtis Major, THEMIS found volcanos and flows of dacite, a chemically evolved lava that implies a complex volcanic history for Mars. Most Martian lava is basalt, a primary volcanic rock. Near the equator of Mars stands a 1,300-km (800-mile) diameter basaltic volcano named Syrtis Major. Several calderas - collapse craters - mark its summit. These formed as molten rock (magma) withdrew from beneath the summit to feed eruptions on the volcano's flanks. The flank eruptions from vents and fissures, however, produced a sequence of glassy, silica-rich lavas called dacites forming cones up to 300 meters (1,000 feet) high and lava flows 10 to 20 km (6 to 12 miles) long. Dacites and obsidian glasses form as crystals fractionate, separating from each other as magma cools and evolves. These minerals are relatively common on volcanos such as Mount St. Helens; their presence in Syrtis Major provides convincing evidence that magma evolution has also occurred on Mars. Lava composition can vary for several reasons, including variations in melting of the mantle source rocks, remelting of earlier lavas, or the evolution of magma as it rises to the surface. A common way for magma to evolve is by forming crystals that grow as the magma cools within a magma chamber. The first minerals to crystallize are olivine and pyroxene, both rich in iron and magnesium. These crystals settle to the bottom of the chamber, leaving the remaining melt enriched in silica and aluminum. Magma composition can also evolve by interacting with the surrounding rocks as the magma ascends. On Earth, magma evolution produces rocks as varied in composition as the basalts of Hawaii, the andesitic lavas of steep-sided volcanoes such as Mt. Lassen, and the granites that form the core of the Sierra Nevada Mountains. The discovery of dacites on Mars show that the martian crust, while dominated by basalt, has experienced complex volcanic processes similar to those found on Earth. Christensen, P.R., H.Y. McSween, Jr., J.L. Bandfield, S.W. Ruff, A.D. Rogers, V.E. Hamilton, N. Gorelick, M.B. Wyatt, B.M. Jakosky, H.H. Kieffer, M.C. Malin, and J.E. Moersch, Evidence for igneous diversity and magmatic evolution on Mars from infrared observations, Nature, 436, doi:10.1038/nature03639, 2005. Part of a multispectral THEMIS infrared image of Nili Patera caldera on Syrtis Major has been superimposed on a high-resolution THEMIS visual image. The dacite flow (magenta) and the volcanic cone associated with it have a composition distinct from the basaltic lavas that comprise most of the caldera floor (blue). Small outliers of dacitic material lie east of the cone. Image width is 16 kilometers (10 miles).